Are you like me and wait until the last minute and think, “I need a bit more fall in the house before the guests come to Thanksgiving”? I do this almost every gathering I have in my home and this year is no exception. 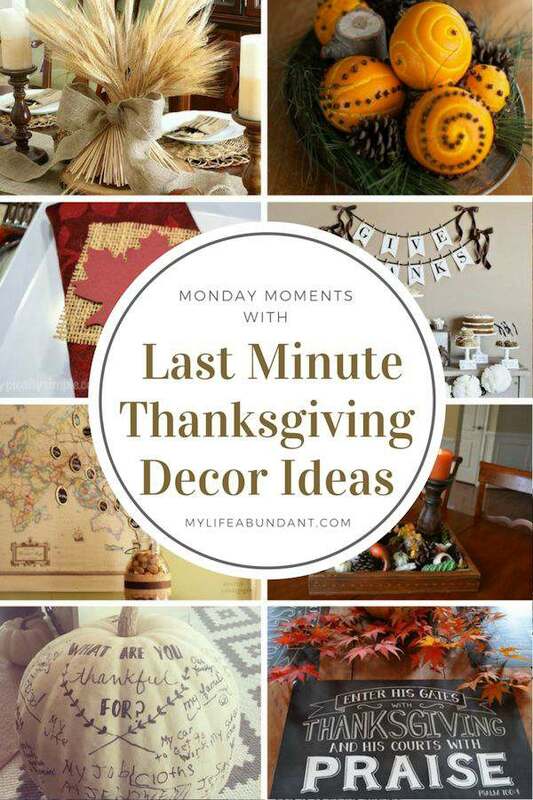 Here are a few last minute Thanksgiving decor ideas I found which could be done pretty easily. Simple and elegant is what I call this centerpiece made from a wheat bundle by Uncommon Design. Wheat bundle and burlap ribbon. It’s that easy. Its orange season here in Florida right now, so this idea of Spiced Orange Pomander Balls is a perfect idea by The Simple Bites. And it smells heavenly in your home too. Here is a cute idea that the little ones could help you make by Typically Simple. Thanksgiving Placecards are a must at each place setting. Have an empty space on the wall or in a china cabinet? How about a Give Thanks, printable to hang there by Tom Kat Studio. I have something like this hanging on an old glass curio cabinet. Love it. Simply Vintage Girl has a lovely idea of making a Thankful Tree. A perfect centerpiece to let everyone know what you are thankful for or have your guest sign each wooden disk with what they are thankful for. A Thanksgiving Centerpiece is a must for the table and this one is too easy not to make. Whats Ur Home Story has a great idea of just adding items from around the home on a simple tray. Done. First, Yellow Prarie Interiors has a lovely farmhouse home tour on this post but check out the pumpkin she made with all her thankful thoughts. Just lovely. How about printable placemats for your festive table? Dear Little Blog has taken favorite thankful scripture and made these lovely placemats for any table. Cardstock and a printer is all you need for this decor idea.